Flowers are not able to be purchased from the hospital but there is a florist in Hamilton. Contact The Regent Florist, 115 Thompson Street, Hamilton, Tel 03 5572 4547. 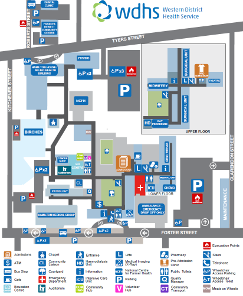 An ATM is located in the reception area of the hospital (please see map). ATMs are also located at these banks on either Gray or Thompson Streets. A range of short term accommodation is available including hotels, motels and caravan parks. There are a variety of supermarkets, restaurants, cafes and fast food outlets located within Hamilton. These are limited at Coleraine and Penshurst. See here for Information on Penshurst. See here for Information on Coleraine.